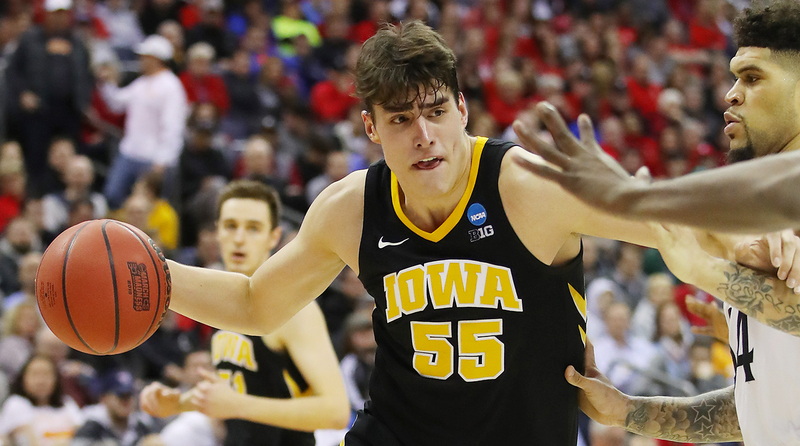 The Iowa Hawkeyes received a scoring surge from Luka Garza to rally and defeat seventh-seeded Cincinnati to earn their first NCAA tournament win in four years. COLUMBUS, Ohio — Iowa played six road or neutral-floor games against at-large quality teams this season. They went 0-6 in those games, losing them by an average of 17.3 points. They lost four of the six by at least 20 points, and a fifth by 16. With that in mind, you could forgive the Hawkeyes if they felt a like they drew the short straw on Selection Sunday when they learned that their first-round game would be against Cincinnati in Columbus, a mere 100 or so miles from the Bearcats’ campus. Rather than running away from their regular season performance away from Carver-Hawkeye Arena or trying to convince themselves it didn’t happen, the Hawkeyes addressed the facts of their postseason situation head on. In fact, it was that very experience in the regular season that helped steel them for playing in front of an atypically partisan crowd for a 7-10 game in the first round of the NCAA tournament. The Hawkeyes did an excellent job zoning everything out and putting their regular season struggles on the road in the rear-view mirror. Behind 20 points from Luka Garza and 19 from Wieskamp, the Hawkeyes advanced to the second round with a 79-72 win over the Bearcats. The strategy, then—expose our opponent’s weaknesses while playing on a big stage—remained the same. But, given the Hawkeyes’ performance on the road in the Big Ten, it only made sense that they might look for new tactics. They found a couple, one in either half, and it made all the difference. Behind the home-like atmosphere, Cincinnati stormed out to an 18-5 lead in the first eight minutes of the game. After the under-12 media timeout, Iowa came out in a 1-2-2 zone extended out to three-quarters court. The Hawkeyes paid for it on the glass the rest of the first half—over the final 12 minutes of the half, Cincinnati grabbed eight offensive rebounds on 16 missed shots—but they stopped the bleeding and slowed down the Bearcats’ offensive flow. They also cut the deficit to five going into the locker room. They didn’t come out of the zone the rest of the game, holding Cincinnati to 54 points over the game’s final 32 minutes. Second, they hit on three huge underneath out-of-bounds plays in the second half, all of which came at big moments. The first came with Iowa trailing by five and was, again, after the under-12 media timeout. The Hawkeyes stacked Nick Baer, Tyler Cook and Garza at the free throw elbow, with Garza at the back of the line. Wieskamp and Cook cut to opposite blocks while effectively setting rub screens for Garza, who simply faded behind the three-point line. Connor McCaffrey inbounded the ball to Garza, who drilled his second three of the game. That stack was a strategic constant for the Hawkeyes this season. This particular set, however, featured a key tactical difference. About six minutes of gametime later, the Hawkeyes got another underneath out of bounds set. This time, Jordan Bohannon, who’s often the go-to guy on such plays, inbounded the ball, and Baer got the open three. He drained it to give the Hawkeyes their first lead of more than one point in the game. It was a lead they’d never relinquish. “It was a little bit like a road game,” Garza said. “They had a huge showing with it being in Ohio. When they came at us really hard, we kept bouncing back delivering punches.” Cases in point: the two threes, one of which Garza hit himself, that swung the game in the second half. 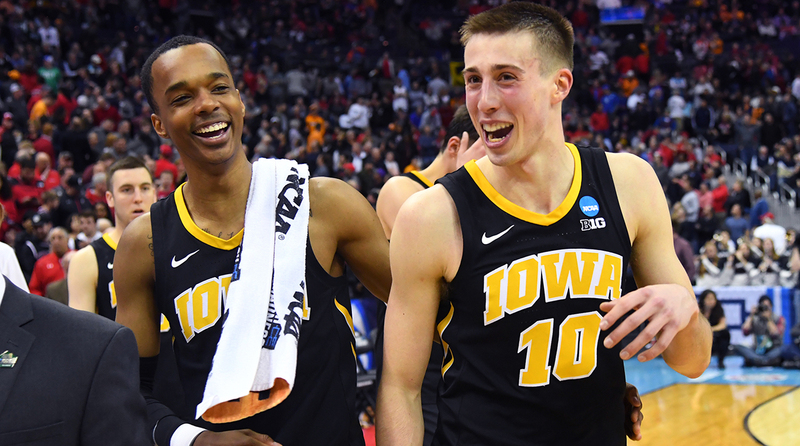 In the process, the Hawkeyes accomplished something they didn’t at all during the regular season. They won what amounted to—with all due respect to their head coach—a road game over an at-large team. And it couldn’t have come at a better time. Among all those games outside Iowa City, this was the only one that could guarantee they’d be one of the last 32 teams playing basketball this season.